Determined Cowboy, under jockey Martin Osuna, setting the fastest time in Sunday's John Deere Turf Paradise Juvenile trials. 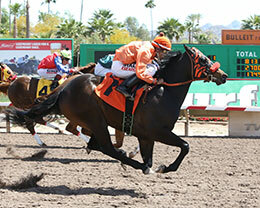 PHOENIX, AZ—APRIL 7, 2019—Determined Cowboy, under jockey Martin Osuna, got up over Dynasty Dinamo by a neck in the first of two trials for the John Deere Juvenile Challenge at Turf Paradise Sunday, setting the fastest qualifying time. The 10 fastest qualifiers, from two 350 yard trials for AQHA Challenge enrolled 2-year-olds, will return to Turf Paradise on Sunday, April 28th to vie for the winner's share of a $25,000-added purse. Also at stake will be a starting spot in the $125,000-est. John Deere Juvenile Challenge Championship(G2) Saturday, October 26 at The Downs at Albuquerque. Racing for owner-trainer Armando Castellanos, Determined Cowboy completed the 350 yards in :18.396 seconds into a 7 mph headwind to garner the top qualifying spot. It was the first career start for the gelded son of leading first-crop sire Hes Relentless from the Western Challenge (TB) mare Shes Western. Bobby Simmons homebred daughter of Bodacious Dash, Fashioneesta posted a three-quarter length win in the second trial to get the second fastest time of :18.446 seconds. Rick Oliver had the riding call for trainer Joe Bassett. Bred in Texas from the One Famous Eagle mare Shes The Eagle made her career debut in the trials. The aforementioned Dynasty Dinamo, under jockey Emilio Tapia, held onto the third fastest time of :18.446 following his close finish to fastest qualifier Determined Cowboy in the opening trial. Roberto Guillen saddled the son of world champion sire FDD Dynasty for owner Ricardo Ramirez. Bred in Texas by Tyler Graham and Franklin Collins, from the Streakin Sixes mare Witchs Streak, Dynasty Dinamo sold for $25,000 at the 2018 TQHA Yearling Sale. For a complete list of John Deere Turf Paradise Juvenile qualifiers, times, sires, dams, owners, breeders, trainers and jockeys CLICK HERE.